Besides posting up reviews of beers that are Metal related, the other part I love to do so much on here is to post up a review from a Texas brewery. Here we have Texian Brewing Company from Richmond, TX, which is just about less than an hour away from the city of Houston. 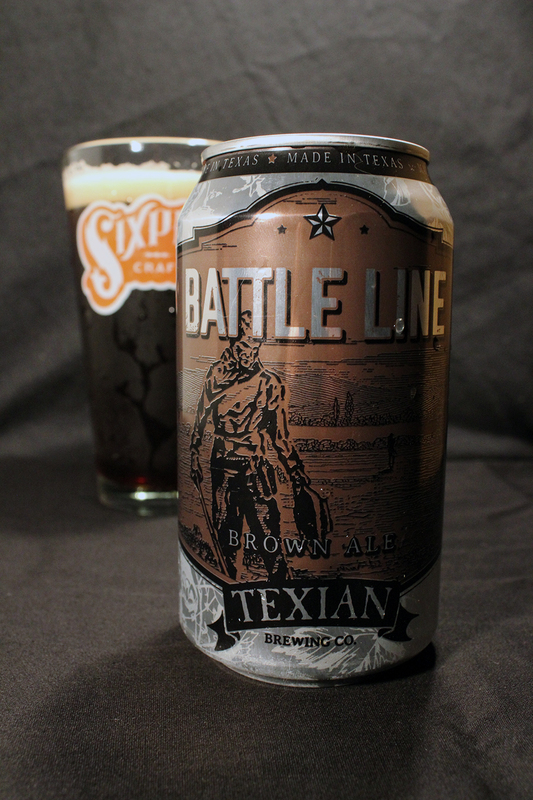 Texian Brewing Company is just a little over 3 years old, and I have had the pleasure of having at least 5 of their offerings, with Battle Line being the first to be posted on this site. This is a great beer, and perfect introduction to this young brewery. On to the battle, we go! The beer was poured into a pint glass from Sixpoint Brewing Company. The beer’s color was a nice dark brown that was semi hazy at first with a large 3/4 of an inch khaki foamy head. There was great head retention, as it stuck around as a pretty thick layer atop the beer, leaving excellent lines of lacing down the glass. The aroma was sweet caramel, and toffee up front. There was a little brown sugar/molasses in the nose as well, followed by a big whiff of of a nutty aroma mixed with roasted malts. The aroma though, overall, was very mild, not very strong. The taste was heavy in character. There was a heavy rich, sweet caramel, and toffee flavor, along with notes of brown sugar/molasses, roasted malts, and nuttiness. There was a great character of a mixed nuts taste in the body of this beer. A small hint of earthiness and floral greenery peek through with the hops, but mostly just heavy in the malt flavor. The body was a bit thicker than a medium body. Battle Line also had a slick and oily body, with a nice prickly bite from the moderate carbonation. The finish, to me, was a bit mouth coating. Overall, I will say that this is a fine example of a good old fashioned American Brown Ale. All the right character profiles in the flavor of Battle Line. In this day in age in the Craft Beer world, we do need to be reminded of the simple styles such as an American Brown Ale. This is one of those beers that I could see myself drinking can after can in a single sitting. I hope to one day visit the brewery, as I love to tour the Texas breweries. Metal Connection: Everyone’s favorite scantily clad Metal warriors, Manowar is who I choose for this beer’s Metal Connection. 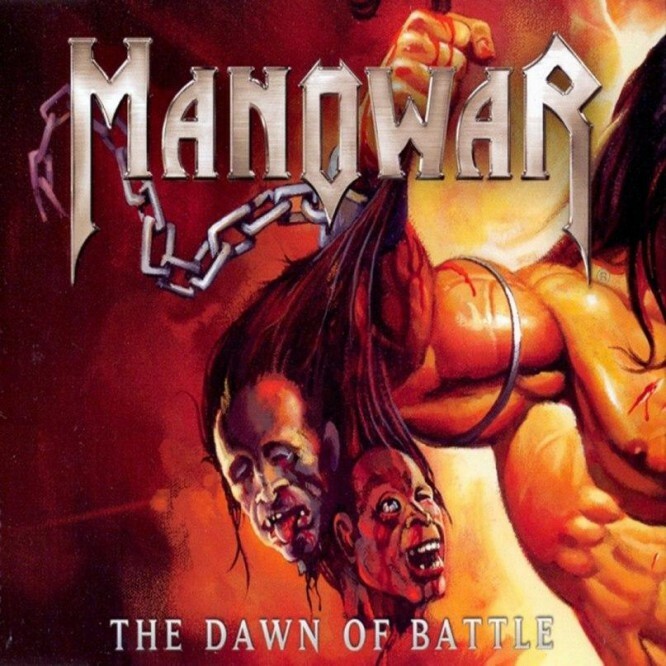 Since 1980, New York’s very own Manowar has been carrying the flag of Heavy Metal into battle with 13 full length albums so far in their career, all covering subjects of war, glory, honor, Norse mythology, and Heavy Metal. This is one of those bands that is loved by many, and hated by just as many. I for one, am a fan of this iconic Metal band. I have several of their songs in my top list. Between their 2002 full length, Warriors of the World, and their 2007 full length, Gods of War, they released a few singles, videos, and EP’s. The Dawn of Battle was the name of one of these singles, which was released later in 2002 after their album came out. It featured the new track, “Dawn of the Battle” along with another new song, “I Believe,” and a song from the Warriors of the World album called “Call to Arms.” Nuclear Blast Records released this single back then. The cool thing about singles is that the usually came with a lot of extras. Back in 2002, this single came packed with an enhanced CD-Rom multimedia section that included a documentary, a promotional trailer, live production lighting animation, and a link to a special website for the band. This song, “The Dawn of Battle” can only be found on this single. It is a great Heavy Metal track, and perfect for this paring to a beer named Battle Line. The video provided here is a live performance of the song that was professionally recorded at the Monsters of Rock Festival in Brazil in 2015. Enjoy!